Riverside's neighborhood is a picturesque, suburban enclave that boasts an abundance of waterfront property along the Long Island Sound and the Mianus River. The scenic community, situated between Cos Cob and Old Greenwich, has a population of about 8,400 and encompasses just over 19 square miles. A former fishing and farming community once known as Mianus Neck, Riverside is a popular location for those seeking a healthy and active lifestyle amid a quaint, nautical atmosphere. Residents enjoy sandy beaches, scenic marinas, emerald green golf courses and access to myriad water sports. Golf and polo are popular with local sports-minded residents, and two particularly popular attractions include the 18-link Griffith E. Harris Golf Course, Greenwich’s only non-private municipal course, and the Greenwich Polo Club, where Sunday matches take place seasonally. Residents take pride in local history, and the circa 1894 Riverside Avenue Bridge and circa 1760 Samuel Farris House are listed on the National Register of Historic Places. Riverside offers a convenient commute to New York City via Metro-North Railroad. Riverside’s tight-knit neighborhoods are family-friendly, welcoming and community-oriented, and share recreational areas like Binney Park with adjacent Old Greenwich. 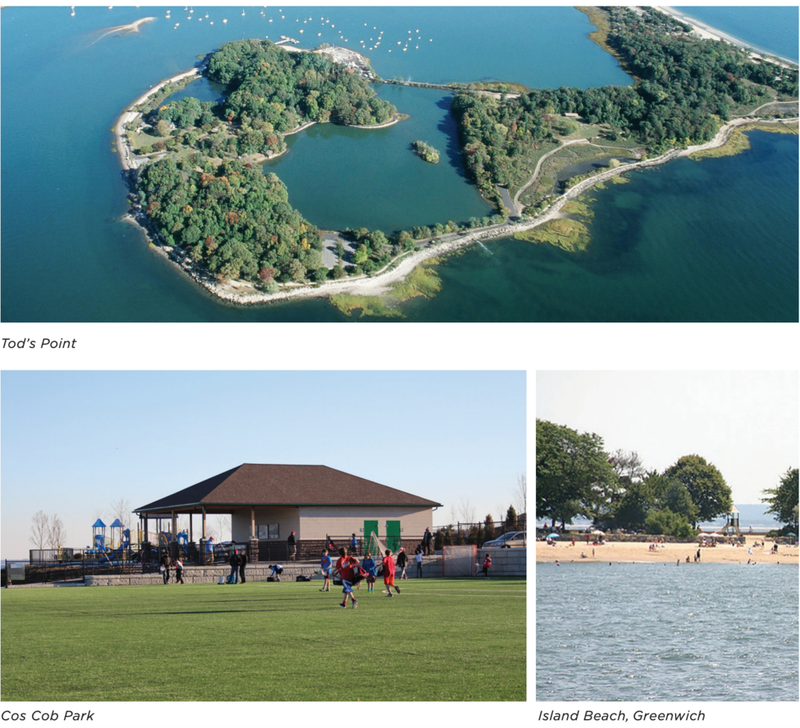 Riverside is great proximity to the town’s parks, including the 22-acre Binney Park and the 147- acre Greenwich Point, both in Old Greenwich. Cos Cob Park, the town’s newest green space addition, is also not far. Tennis courts open to town residents may be found behind Eastern Middle School, as well as at Binney Park, just down the hill. Greenwich Point offers panoramic views of Long Island Sound, and the park is used for swimming, fishing, sailing, picknicking, bird watching, walking, hiking and cycling. Seasonal park passes are available to Greenwich residents.